I bought this under the cycle to work scheme, which is brilliant. I get a £400 bike, the taxman pays for 41 per cent of it and I get 12 months to pay off the balance. So, point one makes the Explorer 500 a winner and the only reason that I - a non cyclist for some years and a bit of a critic of lycra louts in the past - would fork out that sort of cash for a pushbike anyway. However, I now get the whole hybrid bike thing and it's pretty good actually. First word of warning: frame size. Try before you buy. My inside leg measurement of 31 inches should have meant a 20-inch frame so I thought. Correct for a normal road bike, miles too big for hybrids and moutain bikes. An 18 would have been better but in fact 16-inch frame suits me perfectly. If you are returning to cycling after a break forget everything you thought you knew. Those nice fellas at The Bike Warehouse in Faversham took the 20-incher back and swapped my lights and rack to the 16-inch frame, so thanks for that. And it is a good piece of kit. Lovely pearl white paintjob, the Kenda tyres seem pretty good despite some of the reports I've read and after a massive 20 miles of riding, I can tell you it's impressive. You forget how fast you can go for so little effort and the CB is light compared with my girlfriend's five-year-old mountain bike. The 24 gears snick into place using levers on the handlebar, no messing about with working the levers that were associated with derailleurs when I was a lad to get rid of the clicking sound of a slightly out of line chain. Changing gear is simple to understand and in the very low gears just the weight of your leg is enough to propel you along. The 500 comes with Suntour front forks which have shock absorbers like a little motorcycle and have adjustable preload to harden or soften the spring AND there's an air valve which I've yet to play with. I have no idea of the quality but obviously Falcon (which makes Claud Butlers in the same way Toyota makes the Lexus) buys them in from separate manufacturer Suntour. They cost about £80 from the manufacturer's site. No rear suspension on the 500 but the amply padded (and CB branded) saddle sits on a suspension post which does a decent job of absorbing the very worst bumps. The aluminium frame is nicely crafted and neatly welded and the paint seems reasonably robust. But I'll let you know. And then the disc brakes, which look pretty cool, do the job. They work and I've no idea if they weigh more than normal brakes that rub against the wheel rim but I'm assured they last longer. 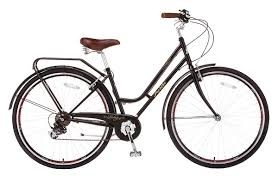 I looked everywhere for a review on this bike and ordered it merely because the chap in the shop thought it'd suit me and I was in a bit of a rush to meet the cycle scheme deadline. Hybrids are better than mountain bikes for normal use and it will stand up to bit of cross country - well across grass so far - but my tip is make sure you get the right frame size. I think Claud Butler is a bit of a premium product at £400 (though I suspect the man himself who built racing bikes in the 20s and 30s in south London would be a bit shocked) in a world where Tesco or Argos will hand you a decent two-wheeler for £100. But once you get in this cycling stuff £400 is still pretty cheap. I had a rack and some mudguards fitted before I bought it and some lights totalling £464 (remember the taxman is picking up 40-odd per cent) but there is a Claud Butler 300e, which might be worth a look as an option. Overall I'm pleased with it so far. I've no idea what the lycra louts and cycle couriers in the big city with their single gear urban machines would make of it but it's ignited a bit of an enthusiasm for cycling and it does me just fine.